Data compiled by the website Fatal Encounters showed that Arizona was consistently among the states with the highest number of people whose deaths were caused by police. Click on map for interactive graphic. 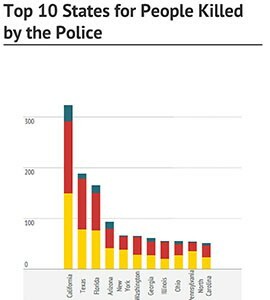 WASHINGTON – Arizona was fourth-highest among states for the number of people killed by police over the last two-plus years, with 93 individuals being killed in that time, according to a comprehensive national database of such incidents. The database, Fatal Encounters, said that despite being the 15th-largest state in terms of population, Arizona trailed only California, Florida and Texas for killings by police in 2013, 2014 and the first few months of 2015. Illinois, by comparison, has twice as many people as Arizona but had only 55 police-related deaths since 2013 in the database. “It surprises me a little bit that a small Western state like Arizona has so many police killings,” said Brian Burghart, president of Fatal Encounters. The site is run by Burghart – whose day job is editor of the Reno News & Review – and gathers its data on police killings from crowdsourcing, paid researchers and through public record requests. Every reported death is fact-checked by Burghart and backed up with a public record or an article in the news media. Still, Burghart cautions that the database is not an exhaustive record of police killings and that the rankings could change as new data come in for earlier years. The project just began last year and is two years away from completion, he said, meaning that number of reported police killings from 2000 to 2013 could rise as new data come in. But he’s confident that numbers from 2013 on are not likely to change. Those numbers show California with the most police killings in the country, with 323 during that period. Arizona had 41 deaths in 2013, 38 in 2014 and 14 so far this year, according to Fatal Encounters data. By contrast, the Justice Department’s Uniform Crime Reports showed the average number of police homicides nationwide around 400 from 2009 to 2013, compared to the roughly 1,100 police homicides Fatal Encounters reports nationally in a given year. Some police warned that whichever set of numbers is right, they need to be taken in context. “Deaths are an isolated incident, so I don’t find it surprising,” said Ed Niedkowski, president of the Arizona Conference of Police and Sheriffs. “You’ve got to think of the thousands and thousands of more arrests that were made in over that four-year period that did not result in a shooting,” Neidkowski said. Good or bad, experts were hard-pressed to come up with a precise reason for the relatively high number of Arizona deaths in the database, but they offered several possible reasons, including social and economic factors and the state’s proximity to the border. “One thing that we do a lot in Arizona that I don’t know any other state has as big of a problem with is that Arizona uses SWAT teams to serve drug warrants,” said David Euchner, a former president of Arizona Attorneys for Criminal Justice. “When a SWAT team comes to a house to serve a warrant, and comes with machine guns, it increases the likelihood that people will be shot and killed,” Euchner said. Another expert pointed to what he says is racial profiling and targeting of young men. “A lot of this goes back to profiling, of bias within the system, beginning at the point of contact and the fact that communities of color are much more likely to be surveilled than non-Hispanic white communities in Arizona,” said Daniel Martinez, a professor of sociology at George Washington University.